(From Wikipedia)Much of the land surrounding the Detroit River is urbanised and, in some places, heavily industrialised. This has resulted in excessive water pollution from the unregulated dumping of chemicals and industrial waste for many decades. Much of the garbage and sewage from Detroit's rapid industrialisation found its way into the river. 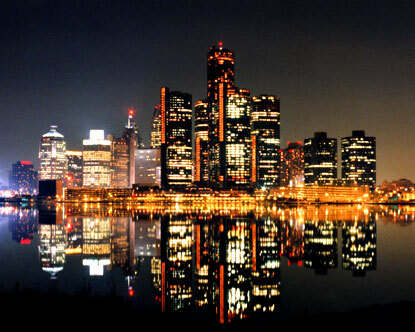 Much of the Detroit River and its shoreline were heavily polluted and unsafe for recreational use. Large quantities of this pollution collected around the mouth of the Detroit River at Lake Erie. The pollutants were so high after the spring thaw that thousands of migrating birds were killed by oil slicks and contaminated water every year. Oxygen levels in the river were depleted to the point where fish were unable to inhabit its waters. 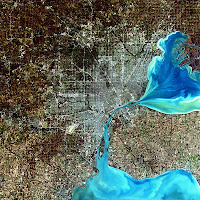 Because much of this pollution drained into and affected Lake Erie, portions of the lake itself were considered “dead” and unable to support aquatic life. Swimming in the water or consuming any of its remaining fish were considered health risks. Thankfully since 2001 there has been a very successful effort to clean up this area and wildlife is returning to Lake Erie and the local river systems, link below. I also found a link for you to watch Julien Temple’s amazing Requiem for Detroit film which shows and puts in context the ruins of modern day Detroit. Watching this film really made me appreciate how Drexciya could have wanted to escape in their minds from this place and dreamt of potential alternate realities just under the surface of things. I also have a link for more photos of the ruins of Detroit, which includes the below image of the Bagley-Clifford Office of the National Bank of Detroit. It’s not all bad, I found a positive news story about a growing urban farming movement that is happening in the city now as well. I never thought I’d get to include a link to the Detroit Water and Sewerage Department but there is a history page there that is worth a read in this context. The main page on Detroit in Wikipedia is far more upbeat and of course there is a whole other side to the urban decay found there too. DRL, going deeper into the sewers!